If you run a restaurant, you know how important a quality takeaway ordering system is. It’s so important that a huge variety of paid services exist to help you accept takeaway orders. But if you want to save money, a WordPress takeaway order system based on WooCommerce and some other plugins lets you kick commissions to the curb and do everything in-house. If you’ve peeked at any of those popular takeaway services, you’ve probably seen that using one of those tools will cost you at least ~$100 per month, plus a hefty setup fee. For example, ChowNow costs $149 per month plus a $399 setup fee for every single location. Yikes – hopefully you’re selling a lot of takeaway food! But if you run a restaurant with a hefty takeout business – e.g. pizza shops, sandwich shops, etc. – you still need a way to make it as convenient as possible for your customers to put in their takeaway orders. All you’ll need is a WordPress site and the WooCommerce takeaway plugin we talk about, as well as a little time to sit down in front of a computer and set up your WordPress takeaway order system. 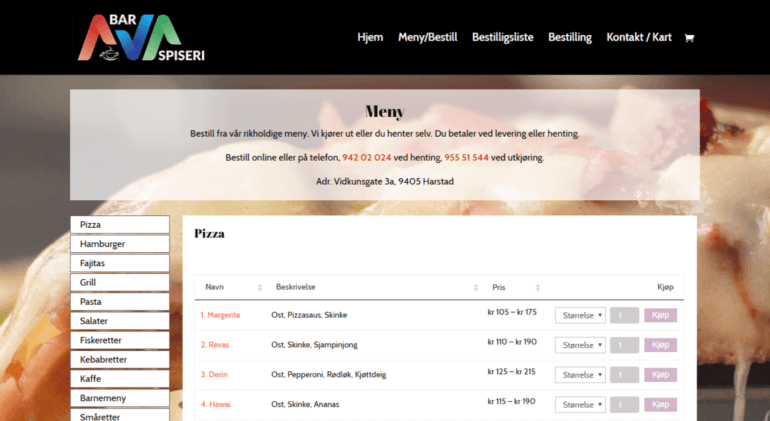 AVA Bar og Spiseri is a takeaway restaurant with an easy to use online order form. Our WooCommerce Product Table plugin has been used to power the order form and to keep it simple for customers to use. There’s a long list of food available to order, so the menu has been broken down into a series of menus in a tabbed layout. Customers click on the menu they want to open it up in the same window. From there, ordering is easy. You just find what you want, select the quantities, add it to the cart and choose collection or delivery. Simple! Continue reading to find out how to create your own online food ordering system. This is a more condensed, takeaway-focused version of our bigger guide on how to create a WooCommerce restaurant ordering system. So if you ever feel like you want a little more detail, that guide will cover everything you might ever need to know about using WordPress with your restaurant. To create a successful WordPress takeaway order system, there are a few tools you’ll absolutely need, and then some others that are optional, but can help you refine how the WordPress takeaway plugin functions. WooCommerce – Free – WooCommerce will handle organizing your different menu items. It can also let you accept online payments if desired. But, most people will probably pay for takeaway orders in person anyway, so you can skip the payment functionality if you want to accept payments in person. WooCommerce Product Table – premium – by default, the way WooCommerce displays items isn’t good for a takeaway menu. WooCommerce Product Table fixes that by letting you display your entire takeaway menu on one organized page. WooCommerce Opening Hours & Chosen Times – £35.00 – this plugin lets you close your WooCommerce takeaway store when your physical store is closed. WooCommerce Delivery Slots – $99 – this lets customers choose when they want to pick up their orders. For example, they could place a takeaway dinner order several hours in advance. Twilio SMS Notifications – $49 – by default, you can view new takeaway orders at your website and you’ll also receive an email. As an alternative, though, you can also use Twilio SMS Notifications to receive text notifications when a customer places a new order. And you can also use it to send texts to customers, like a notification letting them know their takeaway order is ready to be picked up. 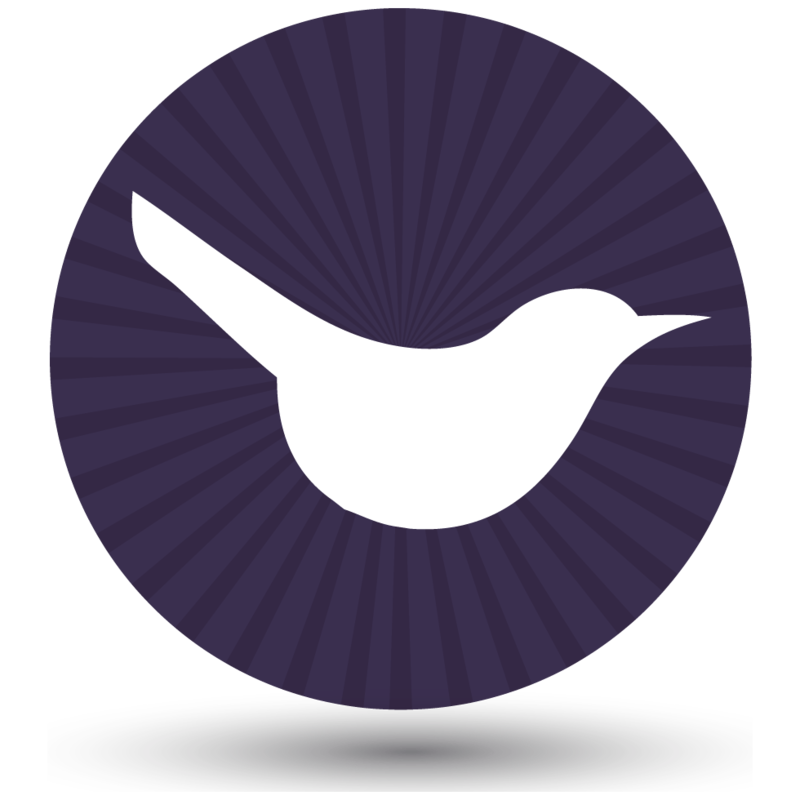 And if you have a smartphone or tablet, you can also install the free WooCommerce iOS mobile app. This app allows you or your staff to mark orders as fulfilled when the customer picks the order up without needing to hop on your computer. How much will all that cost? Ok, so in total, how much will it cost you to create your WooCommerce takeaway ordering system? For just the basic system, you’re looking at only $99 on top of your basic WordPress site. And if you want more functionality, that can cost up to $190 more, depending on what you want. Not free – but a lot better than a $149 monthly fee, right? To get started, make sure you’ve installed and activated the WooCommerce plugin, as well as configured basic information using the plugin’s setup wizard. Unless you want to accept online payments, don’t worry about setting up a payment gateway (you can just have your customers pay when they pick up their order for simplicity, as most will prefer that anyway). If you need help with the WooCommerce basics, here’s a good basic tutorial. Once you have WooCommerce running on your site, you’ll need to add each item on your menu as a WooCommerce product. To do that, go to Products → Add New in your WP dashboard. Because WooCommerce is a general eCommerce plugin, not all of the settings here will apply to your takeaway order system. Title – the name of the menu item. Product data – this is where you’ll add the price and, if needed, let people customize the dish with their own toppings, substitutes, etc. Short description – if you want, you can create a separate shorter description. Category – this helps you divide your menu into different categories. For example, you could have one category for “Pizza”, another for “Subs”, etc. Image – the image for your menu item. Make it as mouth-watering as possible! Publish – once you finish configuring everything, you click this button to save your menu item and make it live. 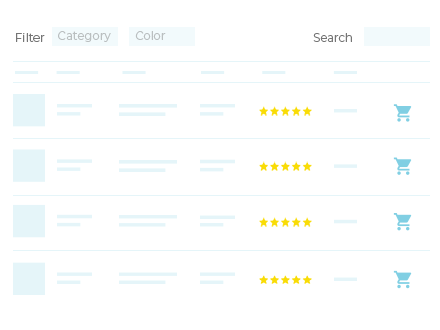 Tags – all your menu item’s tags display in a single column on your menu. Attributes – each attribute displays as a separate column on your menu. Read our online restaurant system guide for more info on how to use tags and attributes. You’ll probably have some menu items where your customers get to pick different toppings or sizes as part of their takeaway order. Or, you might even have items where a customer needs to pick both. Variations – variations are good for core options – like a food item’s size. 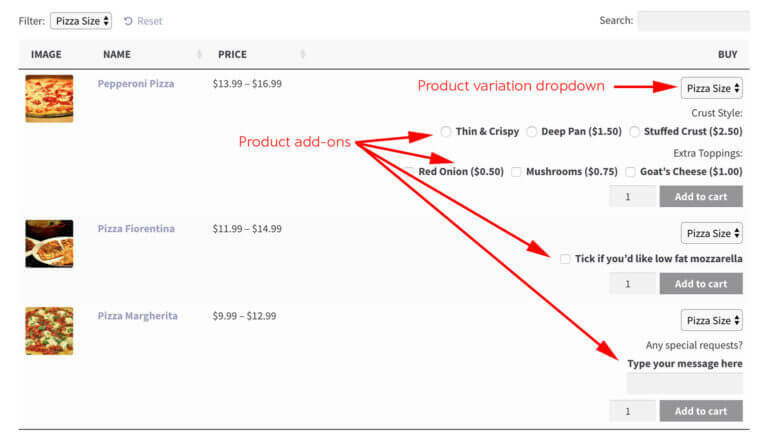 Product variations are built into the free WooCommerce plugin. Add-ons – add-ons are better for upgrades – like toppings to add on to a pizza. You’ll need the official Product Add-Ons plugin to add these extra options to your takeaway meals. Once you’ve added all of your menu items as WooCommerce products, you need a user-friendly way to display them so that your shoppers can browse your entire takeout menu without needing to click around to different pages. Display all of your menu items in one list, or divide them into different categories. Control exactly what information displays, like showing a special column dedicated to whether or not items are gluten-free or vegan. The easy way to create a WordPress takeaway order form for your restaurant. To configure how your menu functions, you can use the plugin’s shortcodes and shortcode attributes. There are some problems with the form, though. For example, it doesn’t actually let customers pick the size of their pizza from the order form. To fix that, you can use the aforementioned shortcode parameters. You can set things up however you want, but here are some good presets to display. These shortcodes will get you straight there. If you don’t like editing shortcodes, then you can also configure most of these options directly on the plugin settings page. To display different forms for each menu category, all you need to do is insert separate shortcodes for each category. People can place a takeout order at any time. Unless you operate 24/7, this can be an issue. There’s no way for people to select what time they want to pick up their order. You have to pay attention to your email or refresh the website to see when a new takeaway order comes in. To refine your WooCommerce takeaway system’s functionality and fix some of these issues, you can optionally use some of those plugins we discussed earlier to change how things work. Woo Opening Hours & Chosen Times to restrict takeaway orders to your opening hours. WooCommerce Delivery Slots to let customers choose when they want to pick up their orders. Twilio SMS Notifications to receive SMS notifications whenever a customer places a new takeaway order. Or, optionally, to send automatic SMS notifications to customers when their order is ready to be picked up. So far, you’ve learned how to create a WooCommerce takeaway order form with all the product options available to purchase from a single page. That’s great if you just have a few options for each product. However, some takeaway ordering websites have a large number of options per product. For example, you might sell pizzas in WooCommerce with a long list of toppings. This would look messy if you listed all the toppings directly on the order form page. But it would be strange for a restaurant to direct users to a separate page for each pizza – that’s simply not how takeaway ordering websites tend to work! The solution is to add the WooCommerce Quick View Pro plugin to your takeaway website. Once you’ve installed the plugin, replace the add-to-cart column with a quick-view column in the product table(s) listing your takeaway foods. Customers can click on this button to view extra photos, variations and product add-on options in a popup lightbox. Once they’ve added a dish to the cart, they remain on the takeaway ordering page – this is much more appropriate and user-friendly than sending them to a separate page for each item. You can also use the quick view plugin settings page to change the name of the plugin and control what information appears in the lightbox. For example, you might want to rename it to ‘Customize Pizza’ or ‘Select Options’. Bonus: Increase your average order value by taking tips on your WooCommerce takeaway website! When you accept takeaway orders online via WooCommerce, it’s easy to miss out on tips. This is because ordering and paying in person is personal and people are in the habit of adding a tip to their order. To increase the average order value from your takeaway restaurant customers, you need to replicate this on your website. Install the Name Your Price plugin. Add a new product called ‘Leave a Tip’ or similar. Scroll down to the ‘Product Data’ section and tick the ‘Name Your Price’ box. You can then choose a suggested price – probably 10-15% of the average takeaway order value. Also type the wording that will appear above the box (e.g. “Please leave a tip”). Display this product in one of the tables on your WordPress WooCommerce takeaway order form page. By creating a WooCommerce takeaway system, you both gain the flexibility to create a truly custom takeaway order system and bypass huge setup fees and monthly fees for other restaurant ordering systems. That means happier customers and a better bottom line for your restaurant! Get started today with WooCommerce, WooCommerce Product Table, and some of the other optional plugins that we mentioned. If you want a more in-depth look at any of the topics we touched on in this post, be sure to read our complete guide to creating a restaurant ordering system with WordPress.